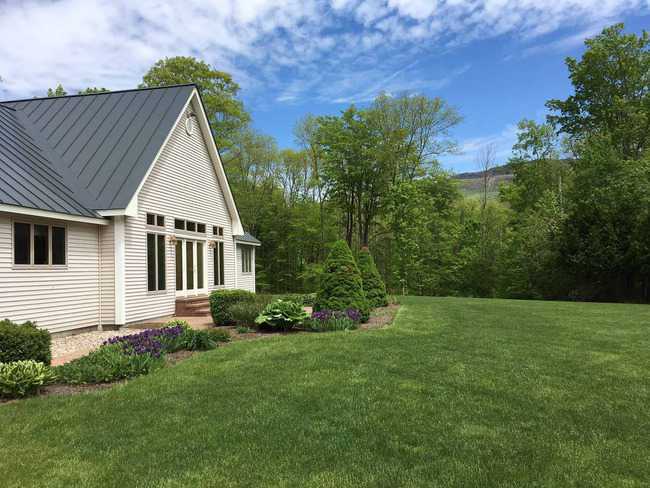 Listings for Tammy Dillman | Dorset VT Real Estate Southern Vermont's Leading Independent Brokerage. Since 1962. Privately perched on six lovely acres in a great locale off Manchester West Rd., this immaculate contemporary ranch offers a spacious, open concept featuring vaulted ceilings and floor to ceiling stone fireplace. The main floor included everything you need, conveniently placed on one level with a lovely master suite on one end that included a large whirlpool tub and steam shower. This home is the ideal spot for gathering family and friends with a finished lower level showcasing a family/game room and additional room for guests. The entertaining continues outdoors with a front patio, nicely landscaped with mountain views while the private rear yard includes a in-ground pool surrounded by additional patio, perfect for hot summer afternoons. Stay cool in the summer with air conditioning and enjoy the warm comfort of Radiant heated floors to keep you nice and toasty on cold winter nights.The main level consists of two large suites with the option for an office or third bedroom, two full baths and a half bath. The lower level has a large family/game room, two additional rooms and a 3/4 bath. This home has it all and will not disappoint! Asking $2,800 / month plus all utilities. Would prefer long-term rental but will consider a Seasonal rental at a rate of $4,000 / month plus all utilities (fully furnished). No pets, no smoking!